MTSU urges campus toward Elect..
MTSU is on the map down under, thanks to a Department of Media Arts professor and her students. “Graham and Zeke,” a film produced and edited by Allie Sultan, an assistant professor in the department, recently won the Jury Prize for Best Documentary Short at the Perth International Queer Film Festival in Australia. Sultan, who won the grand jury prize for best short for her film “Lift Like a Girl” at the 2016 Nashville Film Festival, is quick to pass along the praise. “The film was a 100 percent MTSU student crew,” said Sultan, who spent 2016-17 producing, filming and editing the short with the Women in Film and Television student organization and also serves as the group’s faculty adviser. The students are Kaelin Michelle Bastin, Kyra Nicole Black, Destiny Chamberlin, Kailee Morris, Nikki Annette Neeraas, Cheryl Monique Newsome, Tony Pecorini, Bridget Shike, Sonia Williams and Mariah Woody. 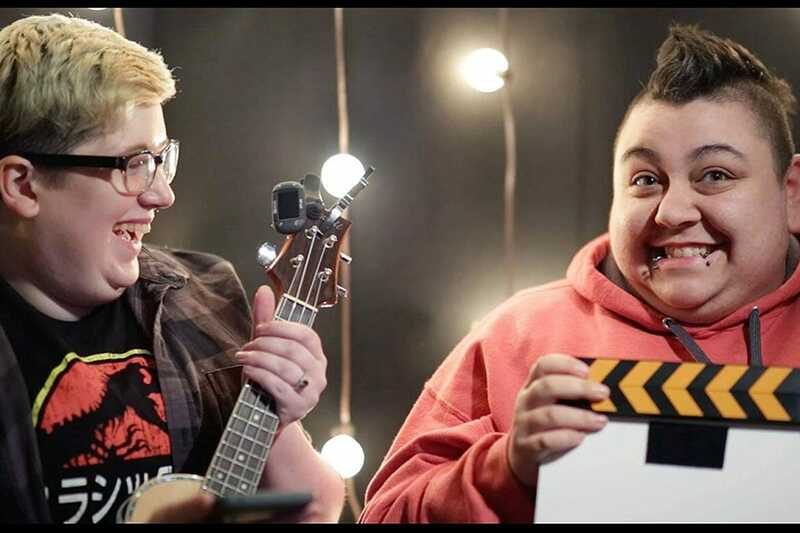 This still from “Graham and Zeke,” an award-winning documentary short film created by MTSU Department of Media Arts professor Allie Sultan and her students, shows the two leads joking during a filming break. “Graham and Zeke,” which recently won the Jury Prize for Best Documentary Short at the Perth International Queer Film Festival in Australia, tells the story of a transgender couple from Tennessee who share their insights on love, gender and pet snakes. “Graham and Zeke” tells the story of a transgender couple from Tennessee who share their insights on love, gender and pet snakes. Sultan said the filmmakers intended to give a voice to the trans community in the South. With a running time of eight minutes, the documentary is enjoying an international film festival run. The film has screened at nine festivals so far this year, including the Out & Loud Pune International Queer Film Festival in Pune, India; Visions Concordia Film Festival in Montreal, Canada; REELING, the Chicago LGBTQ Film Festival; and the Nashville Film Festival. A showing also is planned Oct. 11 at the Gender Reel Film Festival in St. Paul, Minnesota. Though she’s thoroughly enjoying the new film’s success, Sultan is hard at work on her next project, a musical web series titled “Incognita’s Famous Adventures.” The project is a joint venture with Sarah Bailey, an alumna of MTSU’s Recording Arts and Technology Master of Fine Arts Program. For more information on “Incognita’s Famous Adventures,” visit www.facebook.com/InfamousIncognita. For information on “Graham and Zeke,” visit www.facebook.com/grahamandzekefilm. The Department of Media Arts is part of MTSU’s College of Media and Entertainment and serves students majoring in animation, interactive media, media management, photography, and video and film production. You can learn more about the department at www.mtsu.edu/mediaarts.